The Nintendo E3 2011 press conference has just kicked off in typical style, with Shigeru Miyamoto confirming early on in proceedings that the new The Legend of Zelda: Skyward Sword will launch worldwide this holiday season. As we await further details on Wii 2/Project Café, Miyamoto-san also confirmed that a special gold Wii Remote will also be released alongside the new Zelda title. 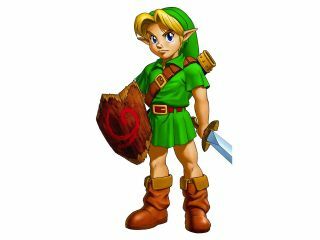 Zelda release, Ocarina of Time, which arrives in shops next week. And then, later in the year, Legend of Zelda: Four Swords will be released on Nintendo DSiWare for free this September. Nintendo is celebrating Zelda's 25th anniversary with music concerts all around the world this autumn, planning two music CD releases; the Ocarina of Time OST, which will be given free to those who register the 3D update on Club Nintendo, and a 25th anniversary CD. In terms of its other key franchises, Nintendo of America president Reggie Fils-Aime has just confirmed that Super Mario 3D will launch for 3DS later this year, showing a new trailer of the game during Nintendo's E3 press conference. Kid Icarus: Uprising for the 3DS will also be released at the end of the year, featuring an online multiplayer mode. While Mario Kart 3DS is also set to arrive in time for Christmas and is, according to File-Aime, "tricked out like never before". Finally, StarFox 64 3D is set to be released this September, Nintendo's confirmed, with multiplayer modes and 3DS camera support.